Unless you setup a proper infrastructure for your next campaign, you won’t be able to send targeted emails to registered subscribers that eventually will lead to lower click-through rates and missed earning opportunities. Before launching your email campaign, you need to ensure that your email marketing infrastructure is in place and up-to-date. 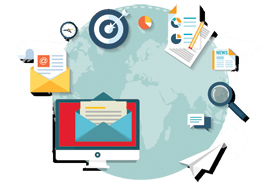 A robust email marketing infrastructure makes sure that your emails are hitting the right inbox. Properly configured email infrastructure is mandatory to bring hot prospects and grow business. Unless you setup a proper infrastructure for your next campaign, you won’t be able to send targeted emails to registered subscribers that eventually will lead to lower click-through rates and missed earning opportunities. If you send bulk promotional or transactional emails through a service provider of repute, make sure that it’s being sent by a dedicated IP address. It’s recommended for marketers to use at least two IPs, individually dedicated to transactional emails and marketing/promotional emails respectively. This is very important in order to having your sender reputation intact. For bulk email campaigns, dedicated IP address is a must. Service providers may raise red flags or may blacklist you if they spot inconsistency and erratic behavior during the execution of campaigns. Before triggering your maiden campaign, ensure that you don’t use an open relay or open proxy. Be in sync with the established industry standard best practices that define regulations for network and server security. Unless you secure your email marketing environment against hacking and breach, even best mailing practices won’t garner any result. An email campaign gets its due success only if it targets genuine recipients who are interested in offers you communicate. Don’t ever purchase an email list from random vendors. The list they provide quite often has unverified names, numbers and emails that likely kill your email open rates and conversion. Only the right email list can help you reach out your targeted recipients and convert leads into actual sales. It comes handy when senders start facing deliverability issues. This pushes marketers to adopt better list hygiene. Feedback loops give marketers a way to manage complaints. You need to get registered with all major ISP feedback loops and must implement a process to remove email addresses that log complaints. If you keep sending emails to those who marked your emails spam will result in deliverability failures. Before start shooting emails, make sure to have ‘A’ records and ‘PTR’ records in place. These records develop trust between an email sender and the inbox provider and a must have email infrastructure for email service providers. Technically, ‘A’ records point your domain to an IP address, while pointer (PTR) records link an IP to your domain. Feedback loops are helpful in cleaning up and monitoring subscriber lists. It also checks marketing strategy and sender reputation that eventually improves your email delivery rates. Do not bombard recipients with emails. Too many emails can annoy them. Promotional emails, newsletters and other offers should be sent at set intervals and at pre-decided schedule. That doesn’t necessarily means having big gap between emails. Keep testing the time when your audience responds the best, then schedule the campaign accordingly.